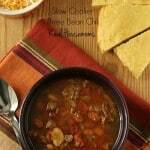 Hearty three bean chili perfect for fall! In a skilled combined onions and ground beef. Sautee until beef is cooked. Add beef, beans, diced tomatoes, chilli mix, and water to slow cooker. Top with cheese and sour cream!